Four Tyco BMW race bikes were stolen from a van outside a Premier Inn near the National Exhibition Centre following Motorcycle Live last night. 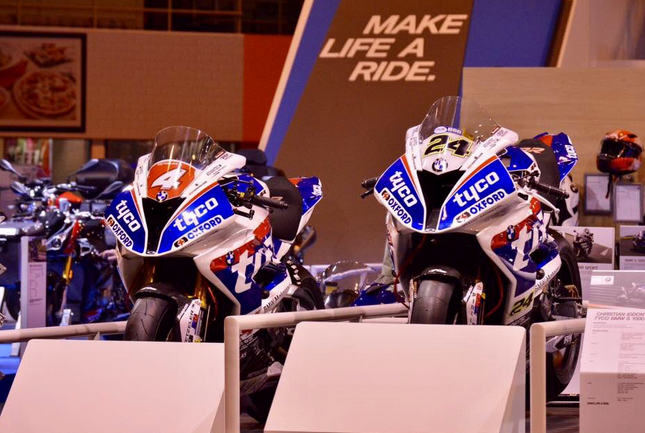 Thieves broke into a Tyco BMW transporter and stole four bikes, including Ian Hutchinson’s treble-winning Superstock machine and Christian Iddon’s British Superbike. The other bikes stolen are a Guy Martin S1000RR and Iddon’s Superstock test bike, which is the only one of the four bikes not in Tyco livery. The theft took place at Premier Inn Birmingham NEC/Airport, Northway, National Exhibition Centre between the hours of 10.30pm on Sunday and 6.30am on Monday. The suspects are understood to have driven away in a white Transit van. The team are asking for anyone who may have seen anything suspicious in the area or with any other information that could lead them to the whereabouts of the machines to contact them direct on 082 8674 8097 or to get in touch with West Midlands Police on the 101 number and ask for PC Shaw. Ian Hutchinson’s treble winning Superstock specification Tyco BMW S1000RR – that won races at the NW200, Isle of Man TT and Ulster Grand Prix as well as finishing second in the British Superstock Championship in Tyco BMW livery.